Mix the cucumber, peppers, and onions together in a large bowl. Add the salt and let stand for one hour. Drain off any excess liquid. In a medium bowl, combine the water, vinegar, celery seed, mustard seed, and garlic. 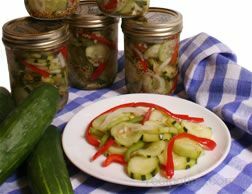 Pack the cucumber mixture into nonmetallic containers such as glass jars. 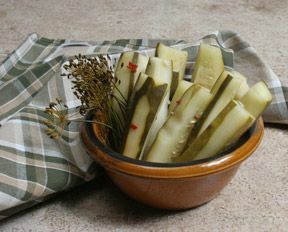 The vinegar will react to any container that is made out of metal and will give the pickles and undesireable flavor. Pour the vinegar mixture in jars until all of the vegetables are covered. Place the lids on tightly and chill for 24 hours to let the flavors blend. Makes approximately 8 cups. NOTE: Pickles will keep in the refrigerator for up to 8 weeks. Other vegetables can be added as desired. Cauliflower, jalepeno peppers, and asparagus, all work well.